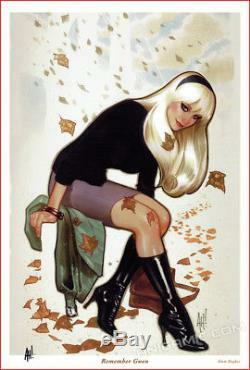 ADAM HUGHES Gwen Stacy ART PRINT. Here is the out of printed, very rare, San Diego Comic Con 2015 exclusive art print by the popular comic book artist, Adam Hughes. He is best known for his works in Batgirl, JLA, Wonder Woman, Catwoman, and Ghost... 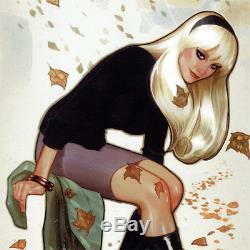 This large, gorgeous art print features a full body pose of Gwen Stacy, simply beautiful! This is based on the variant cover art of Spider-Gwen #1. Acquired directly from the artist. Ready to display and perfect for framing. Size: 19 x 13 inches (48 x 32 cm) Material: Medium weight, matte paper stock Condition: New, with small crease on the lower corner tips. NOTE: We may have more than one available in stock. Your item may vary slightly from the stock photo shown here, like the signature, number or date. This print comes with both protective bag and backing board. The item "GWEN STACY Signed ART PRINT Adam Hughes SPIDER-GWEN #1 Variant Cover 19x13 SDCC" is in sale since Friday, October 13, 2017. This item is in the category "Collectibles\Comics\Original Comic Art\Other Original Comic Art". The seller is "anigamic" and is located in Costa Mesa, California.